ESI Survival Guide | Custodial Self-Collection During Discovery – Defensible Process or Spoliation Guaranteed? 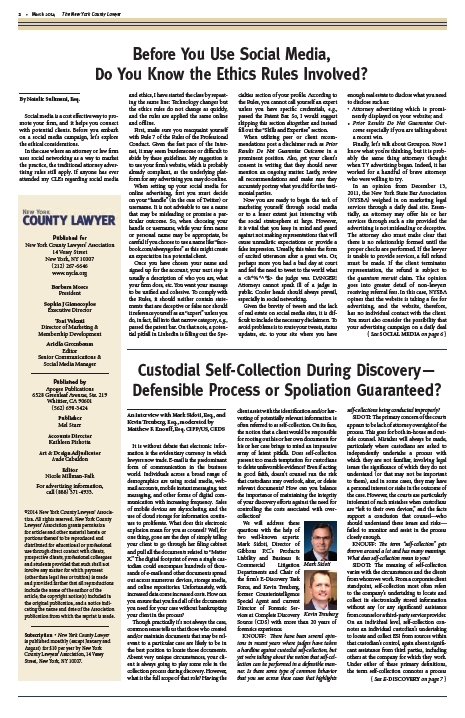 In the March 2014 edition of the New York County Lawyer, the Guide’s Matt Knouff interviews Mark Sidoti, Director of Gibbons P.C.’s Products Liability and Business & Commercial Litigation Departments and Chair of the firm’s E-Discovery Task Force, and Kevin Treuberg, former Counterintelligence Special Agent and current Director of Forensic Services at Complete Discovery Source (CDS) about the frightening and oft-misunderstood practice that is self-collection. Check it out starting on page two. 1. “Self-collection” should not mean “leave the client to their own devices.” If custodians are enlisted in the process of data retrieval, it should be a carefully monitored process with appropriate assistance from counsel under the circumstances. Proceed with caution. 2. Engage your collecting witness regarding their data management practices. Empower yourself by knowing as much as possible about company-wide policies and procedures regarding data governance, but also take the time to understand individual practices and proclivities. 4. Cloud-based solutions such as Dropbox or SkyDrive are not necessarily designed to facilitate a defensible self-collection protocol. Always take steps to collect data from its original source location. View the full article by clicking on the page below. Once you’re in the document, use the magnifying glass to zoom in or out and then just navigate through the pages using the arrows. ← The Fantastic World of OCR!